First day of the 470 North American Championships, a pre-event for the Miami World Cup starting next week, is proving a tough event for the local crews. 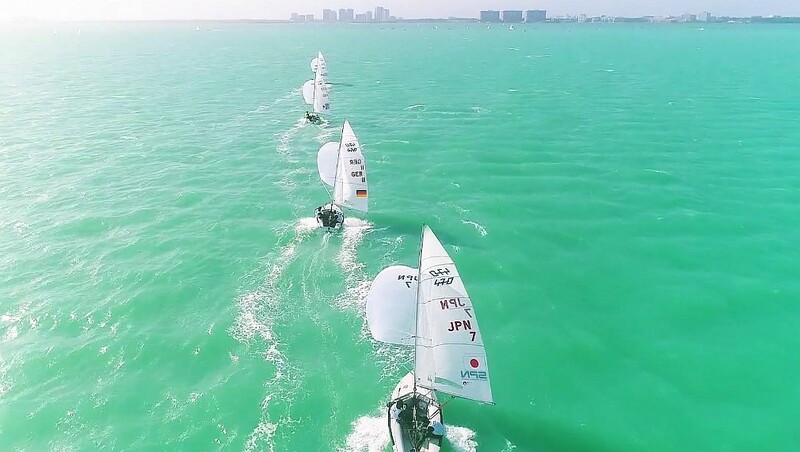 The championship, hosted by the Coconut Grove SC, Miami, Florida, has attracted a strong, world class entry, which overwhelmed the American entry on the opening day. Leading the men’s 470 event by seven points after three races are Anton Dahlberg and Fredrik Bergstrom of Sweden. In second place are Panagiotis Manti and Pavlos Kagialis of Greece, with in third place Hungary’s Balazs and Zsombor Gyapjas tied on 20 points with Jordi Xammar and Nicolas Rodriguez of Spain. Best placed USA pair are Stuart McNay and David Hughes (16,14,18) in 17th place overall. Best placed Brits are Martin Wrigley and James Taylor (15,6,17) in 11th place, with Luke Patience and Chris Grube (18,BFD,7) in 20th. In the women’s 470 event it was a similar story, with the overseas entries taking the lead. In particular Camille Lecointra and Aloise Retornaz of France scoring a 1, 2, 1, to take a 15 point lead ahead of Fernanda Oliviera and Ana Barbachan of Brazil. In third place are Spain’s Bàrbara Cornudella and Sara Lopez. Best placed USA pair were Atlantic and Nora Brugman in ninth place overall. Britain’s Hannah Mills and Eilidh McIntyre (5, 7, DNF) finished the day in 14th place.